I reviewed Kody Keplinger's The DUFF on my book blog back in January 2011, and now it's a feature film. I'd have to reread the book to see how much was changed, but I think a fair amount was; that being said, it ended up being a cute movie, but it seemed to have borrowed heavily from other teen favorites like Mean Girls. I saw the screening on December 30th, and we were told that this was an unedited version of the film; it's possible that it will be edited a bit more before it reaches theaters. Bianca (Mae Whitman) is best friends with Jess (Skyler Samuels) and Casey (Bianca A. Santos), both of whom are considered the school "hotties." 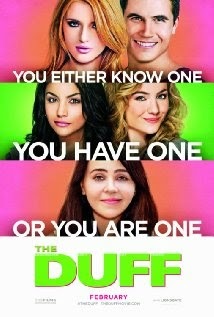 Her neighbor Wesley (Robbie Amell) informs her one day that she is their DUFF: Designated Ugly Fat Friend. 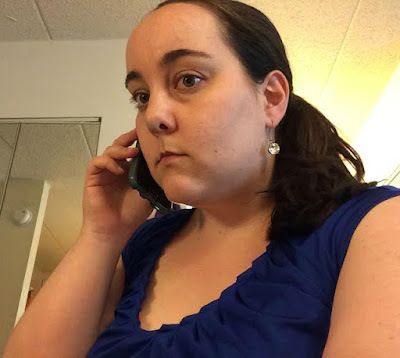 Bianca has never heard of a DUFF before, but when she Googles it, she quickly realizes he is right - and she dislikes this so much that she "breaks up" with her friends and tries to make a go of it solo. She brokers a deal with Wesley: she'll teach him Chemistry, as he's failing the class, if he teaches her how NOT to be a DUFF, as she wants to go out with her crush Toby (Nick Eversman). What they end up learning about each other in the process, though, is surprising, and she soon finds that she likes Wesley more than she thought. I loved all of the technology references and modern-day touches in the film; when Bianca "breaks up" with her friends, they all have their cell phones in hand, and soon start unfriending each other on Facebook, unfollowing on Twitter, and deleting on Snapchat. A few of the hallway scenes definitely reminded me of Mean Girls, with the Burn Book, except everyone was using technology and unflattering YouTube videos instead. I liked Mae Whitman in The Perks of Being a Wallflower and she's great here as Bianca, with her two friends being as clueless as she was that she is the "DUFF" of their group. Yes, see this movie, but it's matinee material. I enjoyed the film more towards the middle/end of the movie than I did in the beginning, but there are some funny performances here - I haven't even mentioned Ken Jeong as Bianca's journalism teacher, or Allison Janney as her mother - and overall it's worth seeing. It's definitely geared more towards teenagers, but as a 27 (now 28) year old, I definitely was still entertained by it. Bella Thorne, as Madison, reminded me of Regina George as the "popular girl" in school, who terrorizes Bianca because she thinks Bianca is moving in on Madison's on-again, off-again boyfriend (Wesley). I don't think The DUFF will hold up as well over time as other teen movies, because of all the modern-day material that makes it so relevant this year, but it's a fun movie to watch. The DUFF is currently playing in theaters, and is rated PG-13 with a runtime of 100 minutes. 3 stars out of 5.